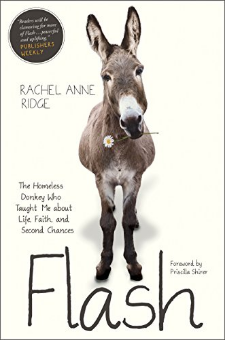 The heartwarming tale of an irrepressible donkey who needed a home—and forever changed a family.Rachel Anne Ridge was at the end of her rope. The economy had crashed, taking her formerly thriving business along with it. She had been a successful artist, doing work she loved, but now she felt like a failure. How would her family pay their bills? What would the future hold? If only God would somehow let them know that everything was going to be all right . . . and then Flash the donkey showed up.If there is ever a good time to discover a wounded, frightened, bedraggled donkey standing in your driveway, this wasn’t it. The local sheriff dismissed Flash as “worthless.” But Rachel didn’t believe that, and she couldn’t turn him away. She brought Flash into her struggling family during their darkest hour—and he turned out to be the very thing they needed most. Flash is the true story of their adventures together in learning to love and trust; breaking down whatever fences stood in their way; and finding the strength, confidence, and faith to carry on. Prepare to fall in love with Flash: a quirky, unlikely hero with gigantic ears, a deafening bray, a personality as big as Texas, and a story you’ll never forget.